Next to the toaster oven, I think the Melitta cordless kettle is the best thing since slice bread. It can make over 8 cups of hot water. 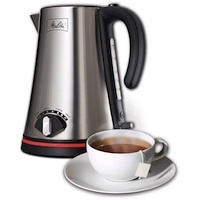 Very easy to use, add water and place kettle on base and flip the switch on. It automatically shuts off when boiled. I keep this on my counter and use the hot boiling water many times a day. The automatic shut off is a life saver. Many times I will forget that I turned it on, while doing house chores. If you don't have one of these, you really should get one. Besides using it for tea, coffee, I also will have it ready if I am cooking and need to add more hot water, or adding hot water to an already boiling pasta pot. I pour some hot water onto my glass stove top to take the food grime off.